‘Fata Morgana’ is the single most important action space in Targi, and unless the situation of the moment demands otherwise, you should strive to occupy it for your own benefit, or else merely to deprive your opponent from benefiting from it. In Targi, it’s relatively easy to block an opponent whenever an enticing Tribe or Commodity card is in play on the tableau, and equally as easy for an opponent to block you. If you hold the first player marker and have your eye set on a particular card, place your first Targi pawn on Fata Morgana, rather than in-line with the object of your desires. Then, when your opponent places his Targi to acquire it, you can block the intersection with your second pawn, while assured of being able to acquire the card when Fata Morgana activates. If you play second, then block first and hope your opponent does not grab Fata Morgana for himself. If it is still available when the time comes to place your second Targi, seize it. If your opponent has already taken it, then ideally you have made him “waste” one pawn placement in the process. If your opponent plays first and opens with Fata Morgana, then you will likely be unable to prevent him from acquiring the targeted card. If the row or columnn offers other worthwhile benefits, then don’t hesitate to position yourself for a direct acquisition. But be wary of making ineffective blocking attempts that leave you with less than desirable pawn placements. 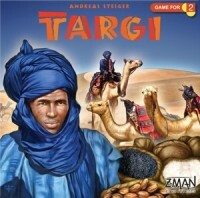 “Tribal Expansion” is a powerful action and, along with “Caravan”, readily tempts players into allocating a Targi to it on any given turn. But inefficient use of the “Tribal Expansion” card can be detrimental in the long run. Though it can be nice to have a card up your sleeve, so to speak, when holding a Tribe card in hand; being forced to take the “Noble” action on a later turn to put said Tribe into play is not the most efficient use of your resources. The greatest benefit of the “Tribal Expansion” comes from the ability it grants you to draw a card and immediately put it into play. Try to time your utilization of “Tribal Expansion” to when you have sufficient resources to almost guarantee you will be able to put the drawn card into play immediately. In particular, you should strive to have at least one gold coin in reserve for when this action is taken. Some Tribe cards offer a choice between paying gold or goods. Unless you are already well-stocked with that precious metal, avoid the temptation to spend gold as a shortcut toward acquiring such tribes. The goods cost of these tribes is generally not extreme…. better to block for a turn or two, if necessary, to purchase with goods later and save the more limited and harder to acquire gold for when it is truly needed. Sometimes I want to get a quick play of a game that is not so quick. Before dinner or at bedtime, it’s nice to have the option to play a short version of a favorite game. I have played Targi a few times, and a game lasts 40-50 minutes. But for a quick play that doesn’t sacrifice quality, I begin the game with the Robber on space seven instead of space one. I still have enough game to gather goods, gold, and victory points, but the game plays in half the time. An added bonus is that I get to do more final scoring, so I can explore strategies that maximize scoring and try new paths to victory. No one likes to play with a player who is prone to analysis paralysis, and I don’t ever want a game to drag. But Targi demands a certain level of attention if a player is to be successful. After placing his meeples and markers, it’s important for a player to decide the best order in which to resolve each of them. My games are usually in the 25-28 victory point range. With numbers that small, every one counts. It’s easy to overlook an advantage given by the “Tribe” cards, so take the time to review your hand and Tribe cards. I have lost games by two or three points and later discovered I didn’t take all the goods or points I was due. Had I closely checked my cards during the game, I would have won those close games. To shake up your game of Targi, try this variant whereby you disregard the default layout of the permanent Border cards. Place the four Raid cards (cards 4, 8, 12, and 16) in their normal corner spots, but rather than place the remaining cards in their normal ascending order, shuffle them and randomly lay out the twelve row and column cards. Then, either place the Robber on the new card in “position 1” and move him as normal, clockwise around the tableau, or place him on Card #1 (wherever it may be) and let him jump from card to card, in order (#2, #3, #4, etc.) as the game progresses. Targi is won by victory points. Throughout the game players will earn gold, goods, and victory points, and there are opportunities to convert one resource to another. Trade or exchange goods and gold for victory points during the final turns. Only victory points are totaled when the game ends.